I can measure the number of days until school starts on one hand. But, I'm not shopping for pens and paper just yet. I've taken these last few days to jam some reunions into my life before I hunker down and get to the books. Fellow riders came in from South Africa, Denmark, Great Britain, USA, and Holland. It felt so natural to be together again; even if we were enjoying cold beers in the city instead of warm coke's at bush camp. Carrie and I crashed at Bastiaan's new house in Utrecht (an awesome alternative to Amsterdam, if you are interested in visiting Holland). 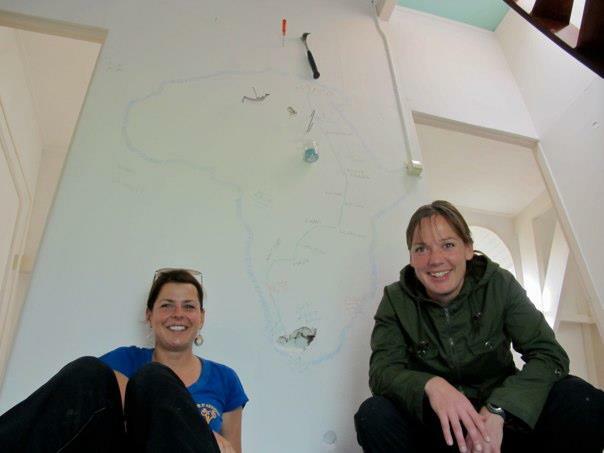 He's just about to renovate, so we took the liberty to start the demo (note the hammer in the wall) and make a temporary art installation (that's supposed to be Africa). 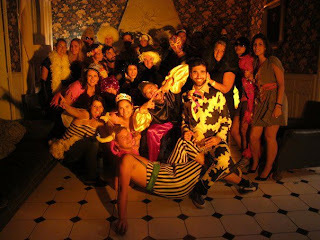 Purpose: Birthday party, "relaxation", and mini-INSEAD reunion. About a dozen of us descended upon Champagne just in time for the first days of harvest, making for the perfect opportunity to contemplate the craft of champagne production while enjoying a little taste of the magic bubbles. In the end, it wasn't the bubbles that were the highlight, it was the costume party that followed. I couldn't identify a unifying theme among the costumes; obelix and asterix, a cow, a pixie, a bee, 80's girls, disco, a luchador, to name a few. But that didn't matter much.